Adding the Under-layers of Styrofoam to the Armature. In this technique of sculpting in cement Styrofoam is applied over a steel armature and carved into the general form of the sculpture. 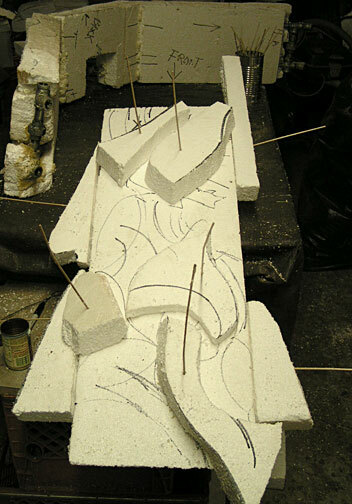 Using Styrofoam as an under-layer allows the artist to create shapes that normally could not be created if cement was applied directly to the steel armature. Later the cement will be troweled over the Styrofoam to a thickness of 1/2 inch or more. 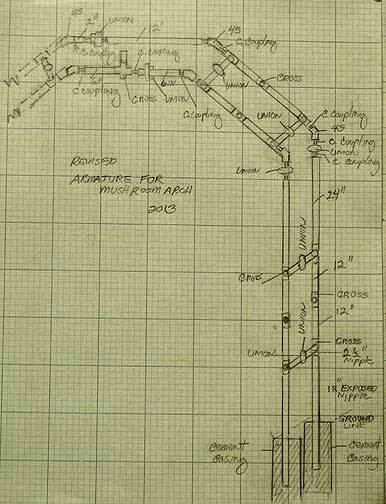 Below is diagram of the revised steel armature constructed out of 1/2 inch galvanized pipe. After the steel armature has been constructed, layers of Styrofoam are built up around armature as seen below in the top section of the arch. 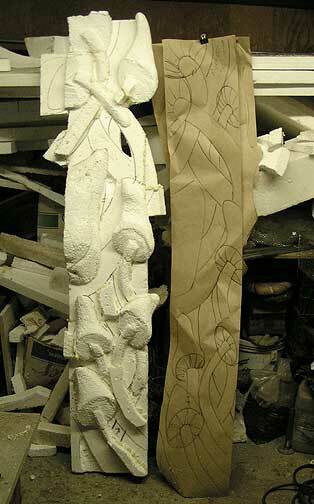 drawing are made to scale and traced on the Styrofoam. They are used as guides for carving the foam. The top layer of Styrofoam for each of the panels is carved separately and will be glued into place before the cement is applied. Left panel of top section of the arch. Styrofoam is glued in the general shape of the mushrooms and carved. Below is a detail of the right buttress completed in cement in 2010. 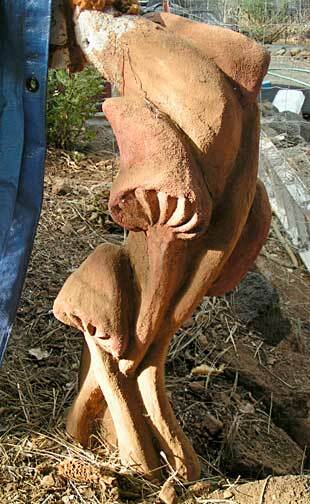 Posted on July 11, 2013, in Psi Keep Center for the Arts, Sculptures, Uncategorized and tagged art center,, art classes in cement, cement sculpture, sculpture, sculpture workshops. Bookmark the permalink. 4 Comments. Impressive. I can’t wait to see it and, hopefully, work on it. 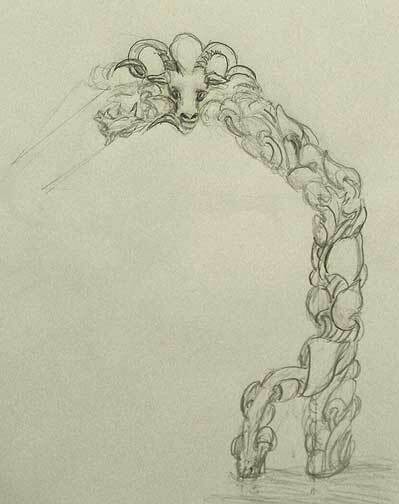 How wonderful to hang at your place yesterday and work on the arch. Always nice to stretch the body and the mind. Looking forward to doing this again on Friday. Let me know when you are available.